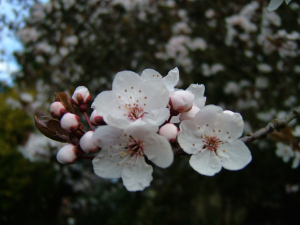 Spring Prunus Blossom, ornamental plum. Observation - Spring Prunus Blossom, ornamental plum. - UK and Ireland. Description: Spring Prunus blossom, started about 4 days ago and after yersterdays hot temperatures it has really progressed. Smells warm and peppery. Spring Prunus blossom, started about 4 days ago and after yersterdays hot temperatures it has really progressed. Smells warm and peppery.